Mak Plus Power Systems design and produce many different kinds of rectifiers in Germany or Europe for various purposes. Depending on your needs and choice, these 20V 10000A rectifiers come with either air, oil or water cooling options. As Mak Plus Power Systems, our goal is to make the process as easy as possible for you. Therefore, 20V 10000A galvanizing rectifiers we design and produce are equipped with a recipe system, a timer, pool temperature control, a user-friendly interface and a PLC control system. We aim to make things easier for you and your operator, so that you can save time and work force. All the operator has to do, is to enter the value of the desired thickness and push the start button. Because, Mak Plus Power Systems Germany's 20V 10000A rectifiers can recognize surface of the component automatically and calculates the needed operation time for the desired thickness. It is as easy to use as can be. All the other processes are done by 20V 10000A rectifier itself automatically. Input voltage values can vary between 230V / 380V / 415 V / 480 V AC and 50Hz or 60Hz for these 20V 10000A rectifiers. Standard plating and galvanizing rectifiers that we offer you as Mak Plus Power Systems Germany, run with a very user friendly interface. With the remote control, the operator can run the device from a distance. The operating system is fully compatible with all automation systems that run manually or with an automation system. The operating system of 20V 10000A rectifiers keeps a record for every aluminum component with different characteristics by using a recipe system. These records can be used as a recipe for different components as well. Therefore the process can start faster. This also ensures a standardized production. It also minimizes possible conflicts that can occur between different recipes. These 20V 10000A galvanizing rectifiers come with a timer which enables you to set it to work for either a limited time or continuously. When it is set to work for a limited time, 20V 10000A rectifier works until it reaches the desired values and then it stops automatically. At the end of the process, the operator gets a warning. When it is set to work continuously, 20V 10000A rectifier keeps functioning normally until the operator interrupts the process when it’s desired to. Your operator doesn’t need to check the temperature of the pool manually or using an external device. Because, 20V 10000A rectifiers measure the pool temperature and show it on the panel. This saves work force and time. An anodizing bath should be between 18 – 22 Grads Celsius. These minimum and maximum temperature values are on the system. 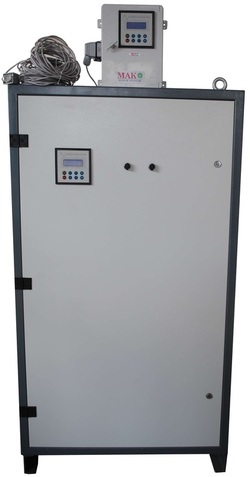 20V 10000A rectifier measures the pool temperature and checks its conformity to the given values, and then runs the cooling system if needed. 20V 10000A rectifier stops when it reaches the desired temperature, so that there won’t be any need for complex temperature control mechanisms. As Mak Plus Power Systems Germany, 20V 10000A galvanizing rectifiers we offer are equipped with the latest AC power control unit. This unit ensures that the chances of malfunction are minimized and it also increases the functions of 20V 10000A rectifier. With this new AC drive unit, the possible errors are prevented even before they occur. Therefore these 20V 10000A rectifiers can endure even the most difficult of circumstances without being concerned about problems that can occur about safety. The new drive system can work with a remote control and it has an automation system. Selective working program option is another advantage of our 20V 1000A rectifiers as Mak Plus Power Systems Germany. Normally in most of the plating pools, a selective working program is used in order to remove unwanted metals from the pool, but this process has to be done either manually or with an external device. With MRS plating rectifiers that Mak Plus Power Systems offer you, this process is done automatically, using the selective program. When the operator starts the process, the output voltage of 20V 10000A galvanizing rectifier keeps increasing from zero, and then turns back to zero again. This process can be repeated indefinitely or for a limited time according to your needs and wishes. This way, you can spare your work force.